Waylon Bacon is a West Coast-based underground filmmaker who specializes in disturbing and grotesque — and frequently absolutely hilarious — short films. Learn more about this filmmaker at his official website and his news blog, plus watch his films on YouTube. Help fund The Ride, the next great film by genre-bending filmmaker Waylon Bacon, who is currently raising funds through IndieGoGo to finance the pic. Waylon Bacon draws the storyboards for his next disturbing short film while holding his cat Lou Rawls in his lap. The 2011 San Francisco Underground Short Film Festival this autumn is screening films by Waylon Bacon and T. Arthur Cottam and tons more. Filmmaker Waylon Bacon is now selling T-shirts on his official website. The Comic-Con International Independent Film Festival runs along with the convention and features films by Waylon Bacon, Tim Russ and more. Help Wanted is Waylon Bacon’s most epic undertaking: An unsettling, revolting and absolutely hilarious look at the worst job in the world. 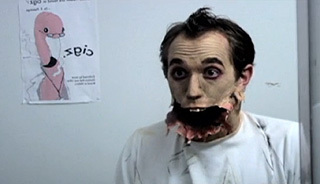 Waylon Bacon’s surreally grotesque short film Poster Boy shows the horrible effects smoking can have on somebody — and make him a star!